December is the time for media outlets to roll out their list of noteworthy events during the past year and an annual “happening” for this writer going back more years than I can remember. So, here is my Top Ten and should you feel inclined to criticize please be gentle, after all it is the Holiday Season. Tiger Woods – End of an Era? Even when Tiger Woods isn’t playing he moves the fan interest needle and after his third back surgery last fall there’s no firm date when he can return to competition indeed there’s no certainty he will return at all. Conceivably this could be the end of the Tiger era and in addition to the impact for him personally and the loss to fans of the chance to cheer him on, the PGA Tour and the business of golf will sorely miss him. Whether he breaks Jack Nicklaus record of majors won or indeed even wins again is not relevant, just his presence is important. 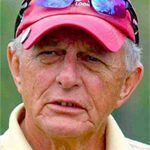 The fact he contacted Ryder Cup captain Davis Love III volunteering to be a vice captain though could well symbolize transition to emeritus status. As expected there’s been a lot of pontificating concerning the Jan. 1, 2016 ban of the anchored stroke which effectively means long putters, i.e., bellies and broomsticks, cannot be used for any round under the Rules of Golf. The long putter is being consigned to the dust bin of history along with concave wedges and square groove irons. So not just on the professional tours but in local tournaments, club events and in fact any round used to calculate a USGA Handicap long putters are out unless used without a third point of contact with the body. It goes without saying however, for the majority of players who never play tournament golf at any level, long putters will continue to be used with anchored strokes and the scores posted for handicaps right along with other frequent flagrant abuses such as for a ball out of bounds, “I’ll just drop one here” and the self-concession of putts. Move over John, Paul, George and Ringo there’s a new Fab Four–Jordan, Rory, Rickie and Jason. The “Tiger Era” may be over but there’s no doubt a new era has begun with ascendency of Jordan Spieth age 22, Rory McIlroy and Rickie Fowler both 26 plus the “old man” Jason Day who is 28. These young men are fan favorites and better yet they are all playing lights out. In 2016 we may see a fifth young man rising to the crowded top. 22-year old Justin Thomas got his first win in Malaysia in October and he hits it as long as anybody plus he proved he can take the pressure with a clutch five-footer on the 72nd green. Bryson DeChambeau, a senior physics major at SMU, joined the elite by winning both the U.S. Amateur and the NCAA individual trophies this past year, a single season achievement shared only with Jack Nicklaus, Phil Mickelson, Tiger Woods and Ryan Moore. He uses irons all the same length, sports a Ben Hogan style cap and quit his college team after the NCAA banned it from post season tournaments. If declares himself a professional DeChambeau would lose his invitations earned as U.S. Amateur champion to the Masters, U.S. Open and British Open. Rumor is he will wait until after the Masters but his recent foray as an amateur in the play-for-pay arena resulted in a T-2 finish in the Australian Masters and a T-30 in the Australian Open. Jordan Spieth had a career-highlight season in 2014-2015 with his five-win-two-majors romp earning $22 million that included the $10 million FedEx Cup bonus. He pushed Jason Day and Rory McIlroy out of world number one ranking, won Player of the Year and a spot on the front page of every sports section. Best of all for golf and particularly golf fans he was born in 1993 so he will be around a long, long while. Lexi Thompson of the LPGA Tour won’t and doesn’t take a backseat to any player. Her primary rival is two years her junior and seems to gather a disproportionate amount of the headlines but we shouldn’t lose sight of the fact Thompson at just 20 has six wins (two this year) and one major each coming at the expense of the teenager for New Zealand, Lydia Ko. The appealing Thompson is ranked fourth in the world and produced three out of four points for the winning U.S. Solheim Cup team for Captain Juli Inkster. And speaking of World Number One Lydia Ko, she won The Evian Championship besting Lexi Thompson by six stokes making her the youngest woman ever to win a major. The final round of 63 gave her the record at the age of 18 years, 4 months, 20 days beating out the previous record holder Morgan Pressel winner of the 2007 ANA Inspiration (formerly the Kraft Nabisco Championship), at 18 years, 10 months, 9 days. Ko’s record of 10 wins after two years on the LPGA Tour (five this season) is remarkable, even besting Nancy Lopez’s record. Let’s hope she can avoid burnout and the psychological burdens that seem to go with being so successful at such a young age. This is the second year she has taken the top spot and $1 million in the Race to the CME Globe. And by the way she was Rolex Player of the Year as well. TaylorMade Golf has had a tough time in the past two years. With declining sales, shrinking market share, employee layoffs and three CEOs in just 18 months the largest equipment company is still on the largest but Callaway Golf under CEO Chip Brewer has undergone a resurgence trying to regain the top spot. Adding to the uncertainty of TMaG’s future, parent adidas hired an investment bank to find a buyer for sister brands Adams Golf and Ashworth. On a bright note the most recent sales numbers in October showed TMaG’s first month sales of the new hot M1 Driver set records. 51-year old Davis Love III is deservedly the captain of next year’s Ryder Cup squad and going into the 2015 Wyndham Championship had 20 tour wins including the 1997 PGA Championship and two Players Championships that is until the crafted a 64 on Sunday to beat up on the Wyndham field, many of whom were under 30, the number of years DLIII has been on Tour. There was an emotional outpouring by fans, fellow players and the media for Love showing he is a man they like and respect, not even considering that he has been on the Champions Tour for two years. After Sam Snead and Art Wall he is the oldest to post a win on the junior circuit. On an edge-of-the-chair Sunday to win by one point after being 4 down through Saturday’s fourball matches, the US Team showed they had the right stuff. But the 2015 Solheim Cup matches will probably be remembered most for the 17th green controversy during Saturday matches when European Team member Suzann Pettersen denied she had conceded American Alison Lee’s putt of just over a foot. Lee thinking it had, since Pettersen and her partner Charley Hull had already headed towards the 18th tee, picked up the ball. Pettersen walked back saying the putt had not been conceded. The Americas motivated certainly by what has been called Pettersen’s “shameful display of gamesmanship,” won eight of the 12 Sunday single matches for Captain Juli Inkster and there was more than small consolation as American Angela Stanford handed Pettersen a 2&1 loss. Pettersen posted an apology on social media following criticism from just about everyone from Team Europe mates to Dame Laura Davies. ← Thank you for subscribing!